The status of the Olallie Butte trail is rather unclear. The trail is mostly in good shape and many people hike it, although about two thirds of the trail are on the Warm Springs Indian Reservation. If you decide to hike this trail, please remember that Tribal Policy governs the trail’s use on Reservation lands. If you decide to hike this trail, the trailhead is relatively easy to find. 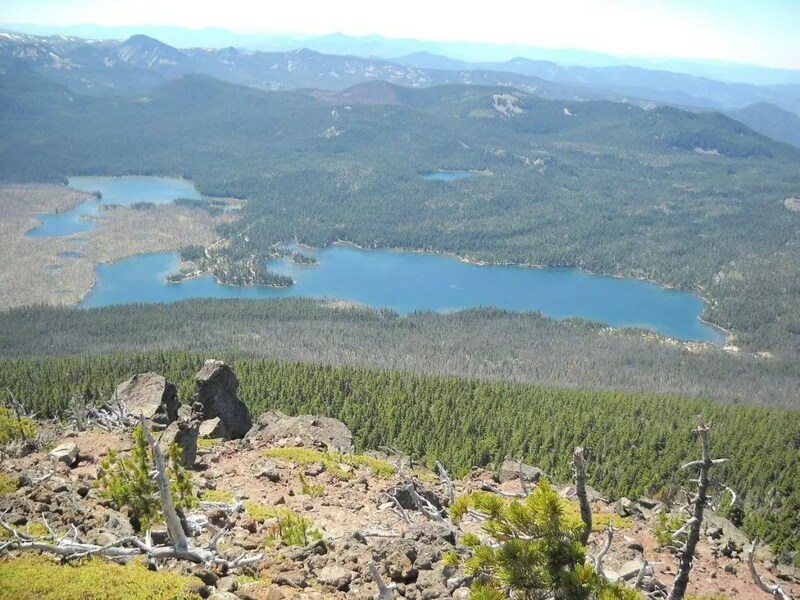 It is at the southern edge of the powerline clearing, about 2.4 miles north of Olallie Lake. There is a road that takes off from the 4220 road up the powerlines. The trail takes off of that powerline road a short distance from the 4220 road and soon crosses the Pacific Crest Trail. There is some erosion on the lower sections which makes for some rough footing. The middle section is very nice as you climb the flank of the butte through some larger timber. As the trail approaches the summit it becomes more exposed and rocky with views to the west. The trail is quite a workout – it gains approximately 2500 feet of elevation over its 3.5 miles. The summit, at 7,215′, is the highest point between Mounts Hood and Jefferson which makes for impressive views in all directions, and there are the remains of an old lookout. There is much to explore when you reach the top, between the flora, geology, history and vistas. Just hiked this trail on 8/21/2017. Recent maintenance has been done clearing downed trees across the trail. There are a couple of big ones that have detours around them.